Ten inches long, eight inches tall. Black head, yellow bill, small white spot above the eye. Back and wings slate-gray, chestnut underside. Black tail. Inhabits forests, orchards, small tree stands in open country, farms and cities. 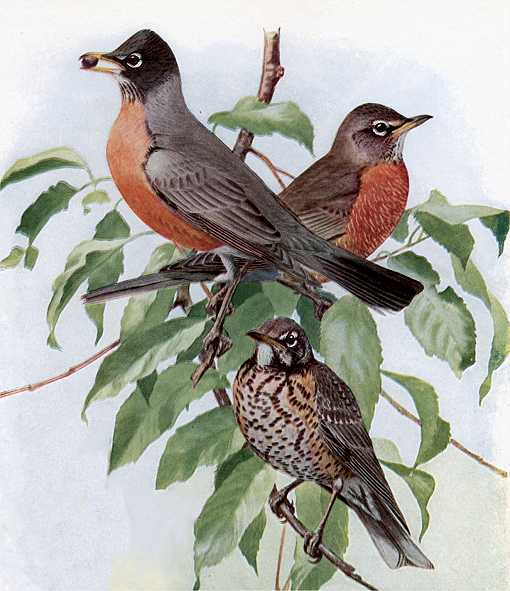 Abundant in most of North America from Mexico, throughout the U.S., to northern Newfoundland, the Hudson Bay Region, Northwest Territories, Yukon, Alaska, and beyond the tree lines into the Arctic coastal areas. Architect, engineer and interior decorator. 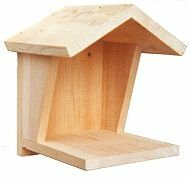 Builds large nests of twigs, roots, grass and leaves lined with a clay cup which is lined with fine grass, hair and wool in various trees or ledges on houses and garages from five to twenty five feet high. Lays three to five blue-green eggs which hatch after about two weeks incubation and young leave the nest in about another two weeks. They raise 2 and sometimes 3 broods in a season. 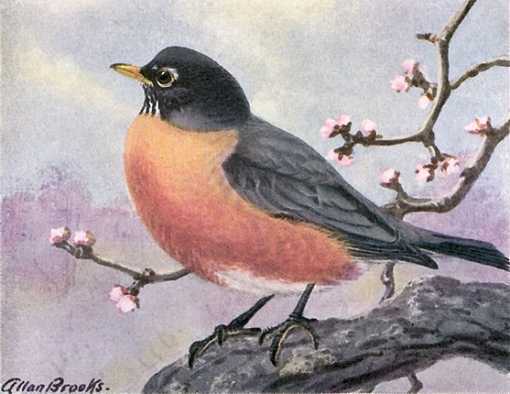 Robins forage in open meadows and the typical home lawns and gardens, often in flocks for worms, grubs, some insects, berries and a variety of other fruit. They run, halt and remain motionless while they watch for movement with their head twisted. Folklore is they listen for worms. Robins are one of the most abundant birds in city back yards and relatively easy to attract to a properly mounted platform. 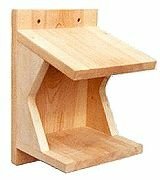 Mourning doves, blue jays and phoebes also may use these platforms. Architect, engineer and interior decorator. Builds large nests of twigs, roots, grass and leaves lined with a clay cup which is lined with fine grass, hair and wool in various trees or ledges on houses and garages from five to twenty five feet high. Lays three to five blue-green eggs which hatch after about two weeks incubation and young leave the nest in about another two weeks. They raise 2 and sometimes 3 broods in a season.